THE BIBLE VIEW is a FREE paper that any ministry can use. 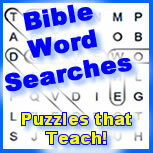 Inside this publication one will find Bible lessons and articles on many subjects, quotes, and puzzles reinforcing Bible knowledge and principles. It is an effective way to get Bible teaching into more households and hands. Only the KJV is used! The paper was designed so one side can be copied on a copy machine on standard 8 1/2 by 11" paper, flipped over and have the second page copied on its back. 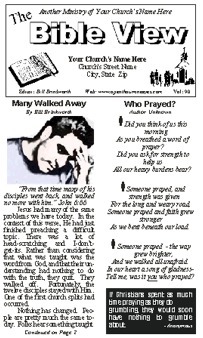 ANY CHURCH, BUS, DEAF, NURSING HOME,CHILDREN'S SUNDAY SCHOOL, OR PRISON MINISTRY CAN HAVE ITS OWN WEEKLY NEWSLETTER! THE BIBLE VIEW makes a great bulletin insert! Sign-up for the Bible View - Home Edition — the e-mail version of this newspaper! A LARGE PRINT version is now available! Use it in your nursing home ministry. "Answered Prayer", "Just You and Jesus", "For What Do You Listen? ", "Be Grateful for ..."
"When You Don't Get Healed", "Thoughts on Cancer", "Why They Had Health Afflictions", "God's Protection"
"Little Can Be Much", "I've Got All I Want", "Just Enough", "Little Is Much When God Is In It", "Looking for a Way Out", "Wealth May Not Give Happiness"
"Strange and Misunderstood", "It's Love, Not Hate", "Why Christianity Is Opposed"
"Another Jesus, Spirit, and Gospel", "Look Out for False Religion", "Satan's Successful Tactic", "Christ, the Root"
"Bottom Feeders or Trophy Catch?". "Advice for a Christian Seeking a Mate", "The Bible and Marriage"
"Die Old Nature! Die! ", "Remarried"
"Filling the Empty Spot", "Beleive and Ask", "Whosoever! ", "Look It Up!" "Keep from Backsliding — Again! ", "Hym Writer Loses Joy of Salvation"
"Saved for Sure! ", "Salvation, "Not by Good Deeds", "Salvation by Faith and Grace", "Faith and Reason"
"Which Spirit? ", "Letting the Devil In", "A Sleeping Church"
"STEP ONE: So You Believe in Evolution? ", "The Pulpit or the Pew?" "What Can the Devil Do? ", "Some Facts about Satan"
"The Law Cannot Save", "Not by Good Deeds", "Only Faith"
"Safe, Close to Jesus", "Be Not Afraid", "Psalm 37:3-7", "When Fear Is Sinful", "Fear of God", "Made in God's Image"
"Should a Christian Tolerate Sin? ", "Too Late! ", "The Insulted Man", "You Are Not Alone"
"Man and the First Sin", "The Wages of Sin Loomed Overhead"
"Creation: How It All Began"
Do you already use the Bible View in your ministry? Could you let us know? There is a great need to have a biblical influence in every home, business, and church. One of the ways this can be accomplished is to leave this paper after a visit to a home, or leave it in a church so a visitor can pick it up and read it. Bible believers need to leave their correct doctrine behind. The BIBLE VIEW contains Bible teachings and could be a good biblical influence for many homes. The Bible View has room at the top where your church name and address can be manually cut and pasted at the top, so that the master will appear to be your church's very own paper. Copy as many of the master your ministry can distribute. CLICK HERE to learn more about how to customize THE BIBLE VIEW. These newsletters are in Adobe PDF format. If you have a free PDF viewing program loaded on your computer, when the volume of the Bible View desire is clicked on, you will have the volume displayed on your system. You can then view and print it from the Adobe viewing program. If you do not have Adobe loaded on your machine, you can go to their site and install it for free. If you do not have the Adobe Reader loaded, click HERE to go to Adobe's site and download it. If you clicked on the volume number you desired and nothing happened or a blank page resulted, you probably do not have the Adobe viewer installed properly.